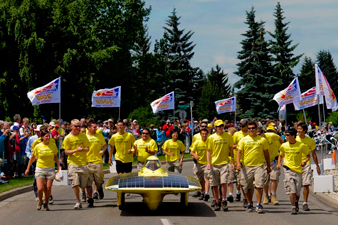 The University of Michigan has won the North American Solar Challenge 5 times, in 2008 with their Continuum, the 9th solar car from the University of Micigan. This 2400 mile race from Texas to Canada was completed in just 10 days, averaging 240 miles per day. The car also competed in the 2007 World Solar Challenge, a 3,000 kilometer race across Australia, finishing 7th after an early crash. Video of Continuum at the North American Auto Show.